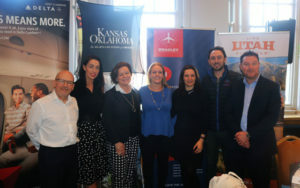 Visit USA Chairperson Claire Doherty and Executive Director Tony Lane hosted trade and media along with a delegation of travel partners for the association’s annual agents lunch in Dublin. Claire Doherty said the association now has 70-plus members, including Stateside airports, tourist boards, airlines and other agents. The key message is that Visit USA is overhauling its website, aiming to make it appeal to the public and trade as well as its members. Claire Doherty said Ireland “has the highest per capital inbound visitor numbers to the States”, with the latest figures showing 11.74pc of the population visiting the US, compared to just 3.43pc in the case of France. Teresa Murphy, Delta: Agents had issues in the past booking the airline’s roomier Comfort Plus seating at the front of Economy, which offers extras including four inches of extra legroom and early boarding. Agents had to book it after booking Economy – now it’s one process, using ‘W’ Class ticketing. Teresa emphasised that onboard wifi is complimentary and changes to the Delta app now include baggage tracking. Emma McHale, Hertz: Key message is that the team, based in Wexford, are just a call away from agents – and can even book car hire (with agents keeping their commission) if it’s necessary. The Hertz website upgrade will be completed by December, with Dollar and Thrifty also featuring on the platform. Matt Bates, Visit Kansas/Oklahoma: The US heartland is perfect for the American dream trip of driving Route 66, which takes in both states. Both are good value destinations, with experiences from the Wild West days, Civil War and Native American cultures. Access is good from Ireland, through established routes such as via Chicago, with the Icelandair summer route to Kansas City, offering fly-drivers the chance to fly in to the city, via Reykjavik, from Dublin, and home from Dallas with the carrier, taking in points in between. Matt Bates said the tourist boards are always keen to work with travel trade and media to work on fam visits. Charlie McNally, Bradley International Airport: The Connecticut airport, voted third best in North America, last year, is equidistant from New York and Boston, and a convenient gateway to the northeast. The airport is also 30 minutes’ drive from North America’s two biggest casinos, and its compact size makes the airport experience – including its Escape Lounge – easier on travellers. Jenny Bridgman, Visit Utah: The state is proving a draw with the over-50s market here who are looking for a flydrive experience. The state is also convenient to Las Vegas (Zion National Park is two hours’ drive), making it handy for a city-and-scenery double combo. Salt Lake City is a gateway to the Rockies, while the state’s big USP is its mighty five national parks, with the likes of Canyonlands National Park the setting for countless cowboy-era movies.